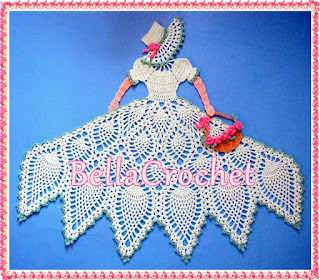 BellaCrochet: Sweet Southern Belle: A Free Crochet Pattern for You! 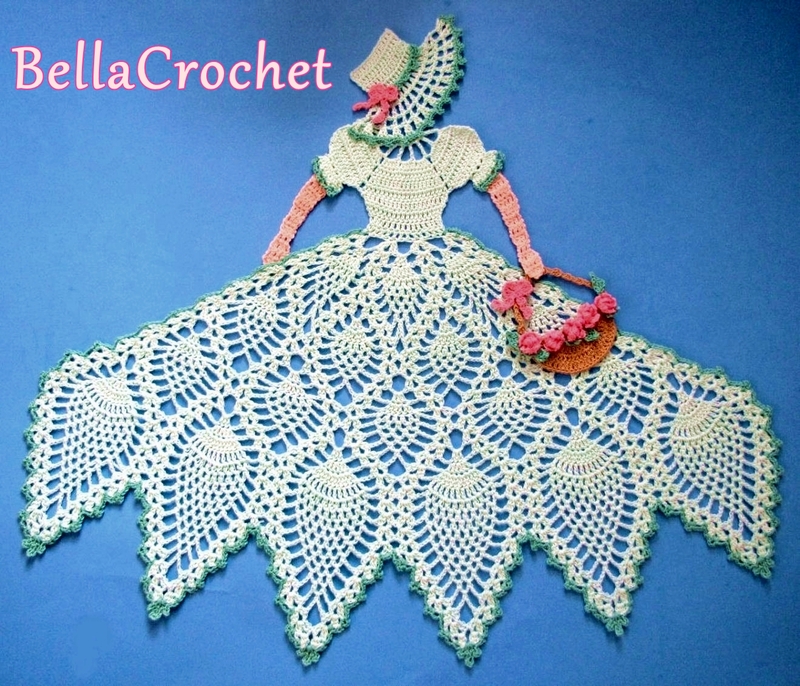 Sweet Southern Belle: A Free Crochet Pattern for You! 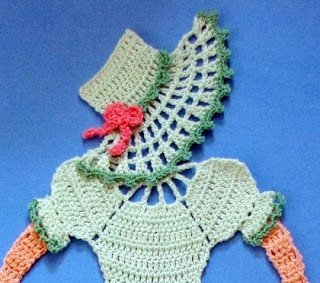 Today, I have my Sweet Southern Belle for you. 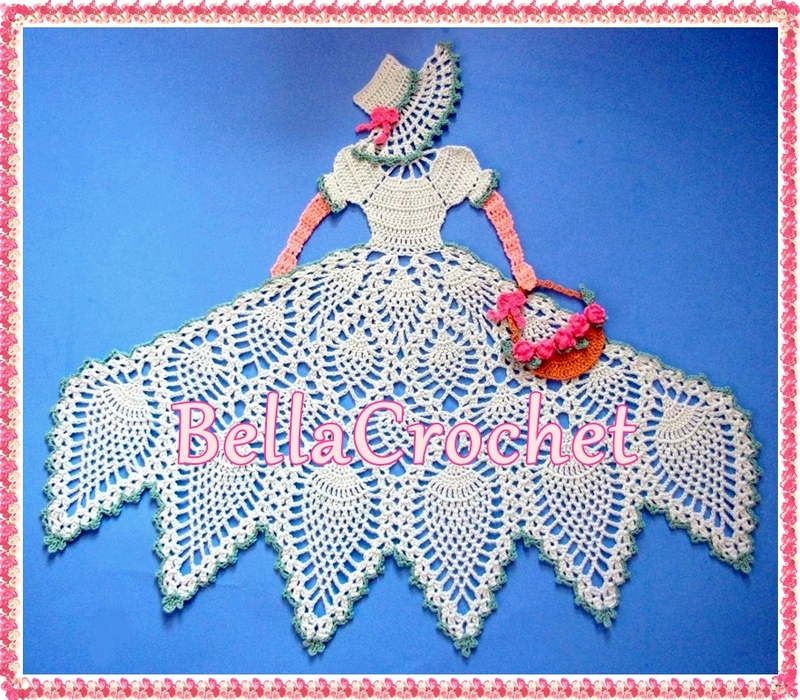 She is my version of a traditional Crinoline Lady; I hope you will enjoy her! Row 2: Ch 7, tr in next st, (ch 3, tr in next st) across, turn. Row 3: Ch 3, 4 dc in next ch sp, dc in next st, 4 dc in next ch sp, ch 1, (4 dc in next ch sp, dc in next st) 2 times, 4 dc in next ch sp, ch 1, 4 dc in next ch sp, dc in next st, 5 dc in last ch sp, turn. Row 4: (Ch 3, dc) in first st, dc in next 8 sts, 2 dc in next st, ch 1, 2 dc in next st, dc in each of next 12 sts, 2 dc in next st, ch 1, 2 dc in next st, dc in each of next 8 sts, 2 dc in last st, turn. Row 6: Ch 2 (not worked in or counted as a stitch), skip first st, dc next 2 sts tog, dc in each of next 10 sts, 2 dc in next st, ch 1, 2 dc in next st, dc in next 16 sts, 2 dc in next st, ch 1, 2 dc in next st, dc in next 10 sts, dc last 3 sts tog, turn. Row 7: For First Sleeve, ch 2, dc next 2 sts tog, dc in each of next 7 sts, dc next 3 sts tog; leaving remaining sts unworked, turn. Row 8: Ch 1, sc first 2 sts tog, (sc next 2 sts tog) 3 times, turn. Row 10: Join green with sc in first st, (ch 3, skip next st, sc in next st) across. Fasten off. Row 7: For Second Sleeve, skip next 20 sts and next ch-1 sp, join mint with sl st in next st, ch 2, dc next 2 sts tog, dc in each of next 7 sts, dc next 3 sts tog, turn. Rows 8-10: Repeat Rows 8-10 of First Sleeve. Row 7: For Bodice Waist, join mint with sl st in first unworked st on Row 6, ch 2, dc in next 17 sts, dc next 2 sts tog, turn. Rows 8-10: Ch 2, dc in each st across to last 2 sts, dc last 2 sts tog, turn. (12 sts at end of last row. Row 1: (Ch 3, dc, ch 2, 2 dc) in first st, ch 3, skip next 3 sts, shell (see Special Stitches) in next st, ch 3, skip next 2 sts, shell in next st, ch 3, skip next 3 sts, shell in last st, turn. Row 2: Ch 3, shell in first shell (see Special Stitches), (ch 3, 3 dc in next ch sp, ch 3, shell in next shell) across, turn. Row 3: Ch 3, shell in first shell, (ch 3, 2 dc in each of next 3 dc, ch 3, shell in next shell) across, turn. Row 4: Ch 3, shell in first shell, *ch 3, skip next ch sp, (sc in next dc, ch 3) 6 times, shell in next shell; repeat from * across, turn. Row 5: Ch 3, double shell (see Special Stitches) in first shell, *ch 3, skip next ch sp, (sc in next ch sp, ch 3) 5 times, double shell in next shell; repeat from * across, turn. Row 6: Ch 3, shell in first ch-2 sp of double shell, ch 3, shell in next ch-2 sp of same double shell, *ch 3, skip next ch sp, (sc in next ch sp, ch 3) 4 times, skip next ch sp, shell in first ch-2 sp of next double shell, ch 3, shell in next ch-2 sp of double shell; repeat from * across, turn. Row 7: Ch 3, shell in first shell, ch 3, 3 dc in next ch sp, ch 3, shell in next shell, *ch 3, skip next ch sp, (sc in next ch sp, ch 3) 3 times, shell in next shell, ch 3, 3 dc in next ch sp, ch 3, shell in next shell; repeat from * across, turn. Row 8: Ch 3, shell in first shell, ch 3, 2 dc in each of next 3 dc, ch 3, shell in next shell, *ch 3, skip next ch sp, (sc in next ch sp, ch 3) 2 times, shell in next shell, ch 3, 2 dc in each of next 3 dc, ch 3, shell in next shell; repeat from * across, turn. Row 9: Ch 3, shell in first shell, ch 3, skip next ch sp, (sc in next dc, ch 3) 6 times, shell in next shell, *ch 3, skip next ch sp, sc in next ch sp, ch 3, shell in next shell, ch 3, skip next ch sp, (sc in next dc, ch 3) 6 times, shell in next shell; repeat from * across, turn. Row 10: Ch 3, double shell in first shell, *ch 3, skip next ch sp, (sc in next ch sp, ch 3) 5 times, shell in each of next 2 shells; repeat from * 2 more times, ch 3, skip next ch sp, (sc in next ch sp, ch 3) 5 times, double shell in last shell, turn. Row 11: Ch 3, shell in each ch sp on first double shell, ch 3, skip next ch sp, (sc in next ch sp, ch 3) 4 times, *shell in each of next 2 shells, ch 3, skip next ch sp, (sc in next ch sp, ch 3) 4 times; repeat from * 2 more times, skip next ch sp, shell in each of last 2 ch sps on last double shell, turn. Row 12: Ch 3, shell in first shell, ch 3, shell in next shell, *ch 3, skip next ch sp, (sc in next ch sp, ch 3) 3 times, shell in next shell, ch 3, shell in next shell; repeat from * across, turn. Row 13: Ch 3, shell in first shell, ch 3, 3 dc in next ch sp, ch 3, shell in next shell, *ch 3, skip next ch sp, (sc in next ch sp, ch 3) 2 times, ch 3, shell in next shell, ch 3, 3 dc in next ch sp, ch 3, shell in next shell; repeat from * across, turn. Row 14: Ch 3, shell in first shell, ch 3, skip next ch sp, 2 dc in each of next 3 dc, ch 3, shell in next shell, *ch 3, skip next ch sp, sc in next ch sp, ch 3, shell in next shell, ch 3, skip next ch sp, 2 dc in each of next 3 dc, ch 3, shell in next shell; repeat from * across, turn. Row 15: Ch 3, double shell in first shell, ch 3, skip next ch sp, (sc in next dc, ch 3) 6 times, *shell in each of next 2 shells, ch 3, skip next ch sp, (sc in next dc, ch 3) 6 times; repeat from * 3 more times, double shell in last shell, turn. Row 16: Ch 3, shell in each ch sp on first double shell, ch 3, skip next ch sp, (sc in next ch sp, ch 3) 5 times, *shell in each of next 2 shells, ch 3, skip next ch sp, (sc in next ch sp, ch 3) 5 times; repeat from * 3 more times, shell in each of last 2 ch sps on last double shell, turn. Row 17: Ch 3, shell in first shell, ch 3, shell in next shell, *ch 3, skip next ch sp, (sc in next ch sp, ch 3) 4 times, shell in next shell, ch 3, shell in next shell; repeat from * across, turn. Row 18: Ch 3, shell in first shell, ch 3, 3 dc in next ch sp, ch 3, shell in next shell, *ch 3, skip next ch sp, (sc in next ch sp, ch 3) 3 times, ch 3, shell in next shell, ch 3, 3 dc in next ch sp, ch 3, shell in next shell; repeat from * across, turn. Row 19: Ch 3, shell in first shell, ch 3, 2 dc in each of next 3 dc, ch 3, shell in next shell, *ch 3, skip next ch sp, (sc in next ch sp, ch 3) 2 times, shell in next shell, ch 3, 2 dc in each of next 3 dc, ch 3, shell in next shell; repeat from * across, turn. Row 20: Ch 3, shell in first shell, ch 3, 2 dc in each of next 6 dc, ch 3, shell in next shell, *ch 3, skip next ch sp, sc in next ch sp, ch 3, shell in next shell, ch 3, 2 dc in each of next 6 dc, ch 3, shell in next shell; repeat from * across, turn. Row 21: Ch 3, shell in first shell, *ch 3, dc in next dc, (ch 1, dc in next dc) 11 times, ch 3, shell in each of next 2 shells; repeat from * 4 more times, ch 3, dc in next dc, (ch 1, dc in next dc) 11 times, ch 3, shell in last shell, turn. Row 22: Ch 3, shell in first shell, ch 3, skip next ch sp, (sc in next ch sp, ch 3) 11 times, *shell in each of next 2 shells, ch 3, skip next ch sp, (sc in next ch sp, ch 3) 11 times; repeat from * 4 more times, shell in last shell, turn. Row 23: Ch 3, shell in first shell, ch 3, skip next ch sp, (sc in next ch sp, ch 3) 10 times, * shell in each of next 2 shells, ch 3, skip next ch sp, (sc in next ch sp, ch 3) 10 times; repeat from * 4 more times, shell in last shell, turn. Row 24: Ch 3, shell in first shell, ch 3, skip next ch sp, (sc in next ch sp, ch 3) 9 times, * shell in each of next 2 shells, ch 3, skip next ch sp, (sc in next ch sp, ch 3) 9 times; repeat from * 4 more times, shell in last shell, turn. Row 25: Ch 3, shell in first shell, ch 3, skip next ch sp, (sc in next ch sp, ch 3) 8 times, * shell in each of next 2 shells, ch 3, skip next ch sp, (sc in next ch sp, ch 3) 8 times; repeat from * 4 more times, shell in last shell, turn. Row 26: Ch 3, shell in first shell, ch 3, skip next ch sp, (sc in next ch sp, ch 3) 7times, * shell in each of next 2 shells, ch 3, skip next ch sp, (sc in next ch sp, ch 3) 7 times; repeat from * 4 more times, shell in last shell, turn. Row 27: For First Pineapple, ch 3, shell in first shell, ch 3, skip next ch sp, (sc in next ch sp, ch 3) 6 times, shell in next shell; leaving remaining sts unworked, turn. Row 28: Ch 3, shell in first shell, ch 3, skip next ch sp, (sc in next ch sp, ch 3) 5 times, shell in next shell, turn. Row 29: Ch 3, shell in first shell, ch 3, skip next ch sp, (sc in next ch sp, ch 3) 4 times, shell in next shell, turn. Row 30: Ch 3, shell in first shell, ch 3, skip next ch sp, (sc in next ch sp, ch 3) 3 times, shell in next shell, turn. Row 31: Ch 3, shell in first shell, ch 3, skip next ch sp, (sc in next ch sp, ch 3) 2 times, shell in next shell, turn. Row 32: Ch 3, shell in first shell, ch 3, skip next ch sp, sc in next ch sp, ch 3, shell in next shell, turn. Row 33: Ch 3, shell in each of next 2 shells, turn. Row 34: Ch 3, 3 dc cluster (see Special Stitches) in ch sp of each of next 2 shells, ch 3, sl st in last st of last shell. Fasten off. Row 27: For Next Pineapple, join mint with sl st between last worked shell and next unworked shell on Row 26, ch 3, shell in first shell, ch 3, skip next ch sp, (sc in next ch sp, ch 3) 6 times, shell in next shell; leaving remaining sts unworked, turn. Rows 28-34: Repeat Rows 28-34 of First Pineapple. Working around edge of Skirt in ch-3 sps and worked sps of shells at end of rows, join green with sc in same st first shell of Row 1 was worked in; ch 3, sc in first shell, (ch 3, sc in next ch-3, ch 3, sc in next shell) 8 times, (ch 3, picot-see Note above-in next ch-3 sp, ch 3, sc in next shell) 7 times, ch 3, picot in next ch-3 sp, ch 3, sc in end of row 34, ch 3, triple picot-see Note- in sp between clusters on row 34, ch 3, sc in remaining end of Row 34, ch 3, sc in next shell, (ch 3, picot in next ch-3 sp, ch 3, sc in next shell) 3 times, ch 3, *sc in sp between shells, ch 3, picot in next ch-3 sp, ch 3, (sc in next shell, ch 3, picot in next ch-3 sp) 3 times, ch 3, sc in end of row 34, ch 3, triple picot in next sp between clusters, ch 3, sc in end of row 34, ch 3, sc in next shell, (ch 3, picot in next ch-3 sp, ch 3, sc in next shell) 3 times, ch 3; repeat from * 4 more times, (picot in next ch-3 sp, ch 3, sc in next shell, ch 3) 4 times, sc in next ch-3 sp, ch 3, (sc in next shell, ch 3, sc in next ch-3 sp, ch 3) 8 times, sc in end of first row, ch 3, sc in st on Row 1 as last shell was worked in. Fasten off. Rows 2-4: Ch 3, dc in each st across, turn. Row 6: Ch 4, dc in next st, (ch 1, dc in next st) across, turn. Rows 7 & 8: Ch 5, skip first ch sp, dc in next st, (ch 2, skip next ch sp, dc in next st) across, turn. Row 9: (Ch 3, dc) in first st, (ch 2, skip next ch sp, 2 dc in next st) across. Fasten off. Row 10: Join green with sc in first st, sc in next st, *(sc, ch 3, sc) in next ch sp, sc in each of next 2 sts; repeat from * across. Fasten off. With green, (ch 4, dc in 4th ch from hook) 5 times. Fasten off. With Rose, (ch 4, dc in 4th ch from hook) 4 times, sl st between second and third dc, (ch 4, dc in 4th ch from hook) 2 times, sl st in same st as last sl st, (ch 4, dc in 4th ch from hook) 2 times. Fasten off. Rows 6 & 7: Ch 3, dc in each st across, turn. Row 9 - 12: Ch 3, dc in each st across, turn. At end of last row, fasten off. Row 2: (Ch 3, dc) in first st, 2 dc in each st across, turn. Row 3: (Ch 3, dc) in first st, dc in next st, (2 dc in next st, dc in next st) across, turn. Row 4: (Ch 3, dc) in first st, dc in each of next 2 sts, (2 dc in next st, dc in each of next 2 sts) across, turn. Row 5: (Ch 3, dc) in first st, dc in each of next 3 sts, (2 dc in next st, dc in each of next 3 sts) across, turn. For Handle, (ch 3, dc in 3rd ch from hook) 12 times, sl st in first st of Row 5. Fasten off. Roll petals to form Rose. Glue base of petals to hold in place. Allow to dry. 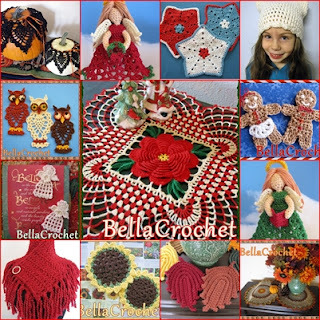 With green, ch 4, 2 dc cluster (see Special Stitches) in 4th ch from hook, ch 3, sl st in 3rd ch from hook, ch 3, sl st in same ch first 2-dc cluster was worked in, ch 9, 2 dc cluster in 4th ch from hook, ch 3, sl st in 3rd ch from hook, ch 3, sl st in same ch last 2-dc cluster was worked in. Fasten off. 1: Place all pieces except Roses and Leaves on a padded surface. Spray with starch. Arrange pieces as shown in photo, shape and allow to dry. 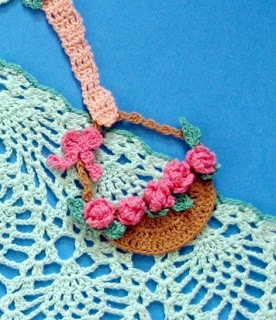 3: Arrange Roses and Leaves in Basket, glue in place and allow to dry. Special thanks go to E. J. Miller, Jolene Ortiz, Debbie Peters, Karen Misiunas and Jewel Fernley for testing these patterns. She's adorable. Thanks for sharing. 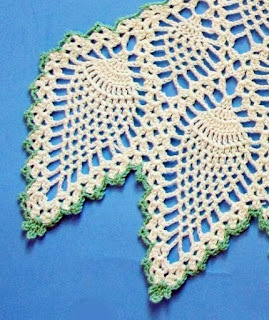 I bought a download of More Vintage Doilies but I'm not sure if it was AA or not. It doesn't have this lady in it. 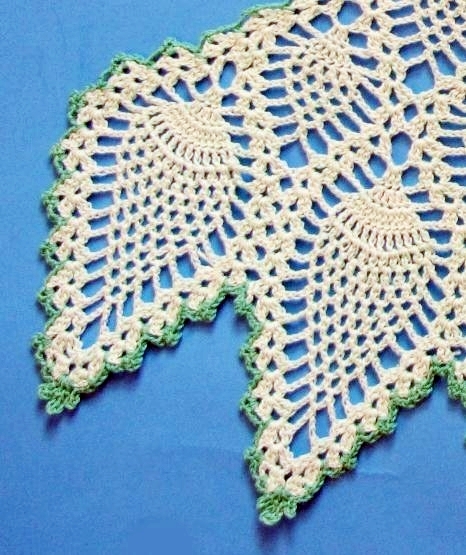 I just finished the swan that goes in the center of a doily-not the one you recently shared. 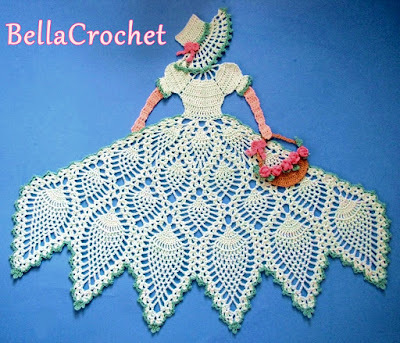 Thank you so much for sharing this beautiful free pattern ! Thank you for sharing this. I'm looking forward to trying it.